Magnetic Island lies eight kilometres off the coast of Townsville. The island has been blessed with fringing reefs, giant granite tors and boulder-strewn vistas. Named by Lieutenant James Cook as he sailed past in 1770, it is suggested that he observed deviations in his compass while in proximity to the island. Cook attributed this deviation to deposits of iron on the Island. This became the reason for the its subsequent naming, however the phenomenon has not been confirmed by later investigations. Magnetic Island is not, like many Barrier Reef Islands, built on coral. It is, like other islands in the Cumberland Island group such as Hinchinbrook and Whitsunday, one of a series of seamounts, in this case reaching a height of 479 metres above sea level at its peak in Mount Cook. These seamounts were formed by outpourings of molten granite from a hotspot in the mantle as the plate moved northwards many millions of years ago. Magnetic Island shares Townsville’s “rain shadow” which provides an average 320 sunny days each year. The Island can be reached by ferry from Townsville which is used by both the 2000 permanent residents of the island as well as the visitors and tourists who use the island for rest and recreation. The island has undergone significant development over recent years and the first impression on arrival is of a wide range of accommodation options for tourists around Picnic Bay. Some of these are top quality, high-rise apartment hotels with facilities including huge swimming pools and excellent restaurants. Longer term island resident tend to feel that the homely, village feel of the past has been lost. But the visitor will find a range of offerings to suit a range of resources. Unfortunately, there is no significant camping facility on the Island. For visitors wanting a more natural experience, the Magnetic Island National Park is concentrated in the centre of the island and at 27km2 takes up 52% of its land mass. Well-developed walks are the key feature of the park. Wildlife on the Island includes allied rock-wallabies, particularly found on the lower reaches of Mount Cook, and koalas. Koalas were brought to the island in the 1930’s to protect them from hunting as part of a State Government plan to open up an export trade with the London fur market by providing a bounty on each koala skin. Today, koalas can be seen in the eucalyptus trees along several walks. Just off the island itself, extensive sea grass meadows provide food and habitat for sea turtles and dugongs. The sandy beaches also provide nesting sites for the turtles. Open eucalypt woodland of bloodwoods, stringy barks, and grey ironbarks cover much of the Island whilst hoop pines are found on headlands, often growing spectacularly amongst large boulders. Given the islands location in the dry tropics it lacks rainforest areas. The koalas are seen in the eucalyptus trees, common brush-tailed possums are regularly seen at night with the assistance of a good torch. The presence of death-adders, which are ambush predators requires some caution as they hide under leaf layers but the islands green tree snakes are both picturesque and harmless. Bird life on the Island is prolific. Commonly seen are bush stone curlews which have adapted and forage around eating areas. Their nocturnal cry is unnerving. Over 180 birds have been recorded on the Island. Common birds include rainbow lorikeets; helmeted friar birds; laughing and blue-winged kookaburras; orange-footed scrub fowl; sunbirds and spotted drongos, southern boobook owls. On the beach you may see silver gulls, crested terns, sandpipers, and soaring on high white-bellied sea-eagles, Brahminy kites and ospreys. The best way to get to know “Maggie” is by using the extensive walking tracks. 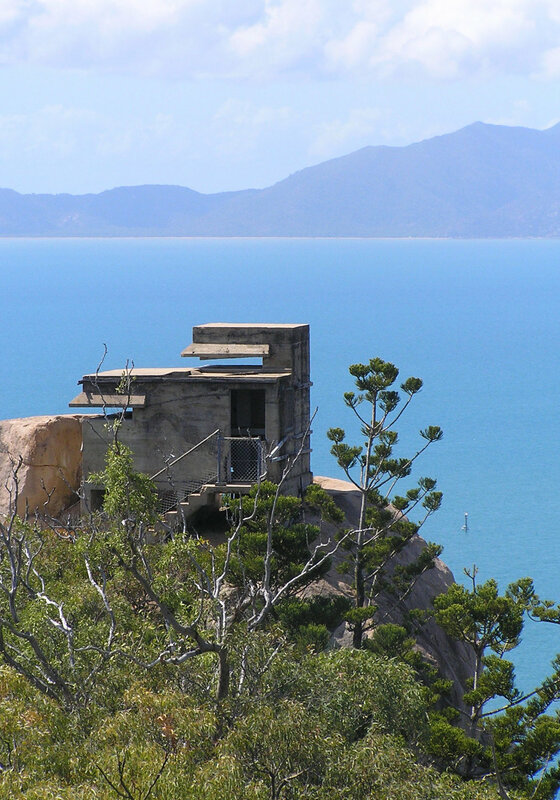 The most popular track is the Forts Walk, which is a 4km return track that takes you to the historic remains of the years when Magnetic Island played a key part in Australia’s defence during World War II. The Island was fortified as a coastal battery to protect the shipping that serviced Townsville which was a major defence force site. Today this walk provides a trip through history and breathtaking views of the Palm Island group to the north and south to Bowling Green Bay National Park. The Forts Walk track starts at Horseshoe Bay Road at the turn off to Radical Bay. The track ascends, sometimes steeply to follow a ridge behind both bays before arriving at the remains of the fort complex. The Nelly Bay to Arcadia track is a 5km one-way moderate walk which goes through vine thickets, climbs gradually to the saddle between Nelly and Horseshoe Bays and then follows the ridge to views over Horseshoe Bay. At this point the track splits into two with one going to Arcadia and the other to Horseshoe Bay road which leads onto other tracks. The Island also offers a range of activities that will appeal to a wider range of people. These include diving on the fringing reefs. This could be snorkelling, but training is available for those who wish to access the beauties of the reef through scuba diving. Courses up to the level of diving instructor are available. Sea kayaking tours are available, led by experienced guides and catering for all levels of experience. The tour around the headlands and through the bays brings a wider range of the Island’s beauty. For those who want something gentler, walking along the foreshore is very pleasant.